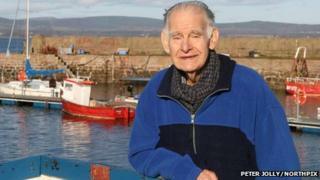 The last native speaker of the Cromarty fisherfolk dialect has died. Retired engineer Bobby Hogg, 92, was the last person who was still fluent in the dialect used in parts of the Black Isle, near Inverness. His younger brother Gordon was also a native speaker. He died in April last year aged 86. The dialect is believed to have arrived in the area with fishing families that moved north from the Firth of Forth in 15th and 16th centuries. The families were thought to be the descendants of Norse and Dutch fishermen. In 2009, researcher Janine Donald compiled a booklet of Cromarty dialect words and phrases for Highland Council's Am Baile project. The initiative, which involved recording conversations between the Hogg brothers, was part of an effort to preserve the dialect. The 40-page publication produced also has weather lore, biblical expressions and local tales and customs. Included was the word "tumblers" for dolphins and harbour porpoises and phrases such as "At now kucka" for a friendly greeting. Other words and phrases included bauchles which means old, ill-fitting shoes, droog-droogle for heavy work in wet weather and Jenny Muck, a female farm worker. Earlier this year, Highland Council made a commitment to recognise and protect the region's languages and dialects.